Tory Historian apologizes for the gap in postings. These will resume with their usual (and even better) regularity. Of course, should any reader want to post something, Tory Historian will be happy to know of it. 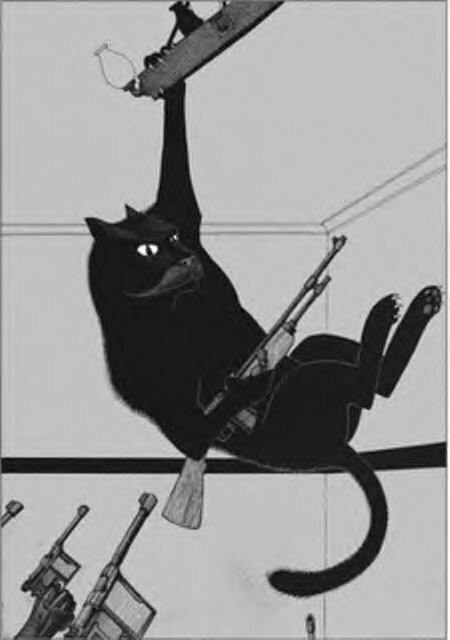 In the meantime, here is an illustration from one of the greatest of the twentieth century novels, Mikhail Bulgakov's "Master and Margarita", a modern reworking of the Faust legend, a novel account of the Crucifixion and the events surrounding it, a satire on the Soviet Union and many other things. Tory Historian cannot recommend it highly enough. 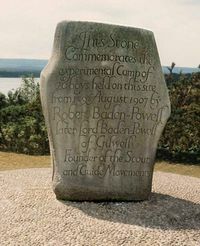 January 24, 1908 marked the publication of the first instalment of Robert Baden-Powell’s “Scouting for Boys”. There were six fortnightly instalments, which were collected and published in book form later in the same year. Both the magazine and the book version became immensely popular and not just among parents but among boys as well. The youths supported the troops by carrying messages, which freed the men for military duties and kept the boys occupied during the long siege. The idea of keeping children occupied with something useful that they can perceive to be useful is not a particularly difficult one but has disappeared from most of our educational discussions. It was not only boys who found the scouting exciting, forming their own groups on reading BP’s words and asking him for help, but also girls, who formed girl guides or girl scouts in some parts of the world. The twin movements spread through the British Empire and North America, then the rest of the world. It is worth noting that the Young Pioneers, set up in the Soviet Union and other Communist and would-be Communist countries, copied the Scout and Guide Movement in many details. The reasons for these ideas becoming moribund are many and some of our readers may well be able to have a discussion on the subject. One can still see scout groups, mostly coeducational ones, still proud of what they do. But they are ever fewer in number. Which reminds Tory Historian of an interesting moment in Dorothy L. Sayers’s “Murder Must Advertise”. The somewhat paternalistic advertising agency at the heart of the story employs a number of messenger boys, all from working class families, straight out of school at the age of fourteen or so. The boys are made to do physical jerks every day by a retired sergeant and encouraged to sit and read after lunch. One boy, Ginger, who becomes Lord Peter’s scout, reads Sexton Blake stories, which may have been ludicrous in their plotting but were extremely well written with no concession to childishness or lack of education. And yet Sexton Blake was known as the “office boys’ Sherlock Holmes”. Ginger also keeps a diary of what he has managed to find out from his mates, which he has to give to his oldest brother, a police officer, as the middle brother accuses him of the unspeakable crime of writing “pwietry”. Another of the lads spends his time engrossed in “Popular Mechanics” magazine when he is not running errands. They are, of course, too superior to be scouts by this stage. That, as far as Ginger and his friends are concerned is for little ones. Counterfactuals are a lot of fun and, except for people who say rather grandly that they are not interested in alternatives, thus showing themselves to be determinists, of some import. Faced with certain historical developments it is tempting to take them apart and remove one particular aspect to see whether the same conclusion could have been reached. Most times the author of the counterfactual has to admit that history would probably have been quite similar. There are, of course, some events and some people so crucial to the particular historical development that took place that their absence would, quite literally, have made all the difference in the world. One such event is the arrival of Lenin at the Finland Station in Petrograd in April 1917. The one I am proposing as a question is considerably less important and less likely to have made any difference. There has been a great deal of what might be called kerfuffle around the formerly secret documents, now unearthed, that show Guy Mollet, then Prime Minister of France, proposed, firstly, a union between France and Britain and, when that was greeted with pursed lips and raised eyebrows, for France to become part of the Commonwealth. As it happens, Sir Anthony Eden rejected both suggestions, no doubt with some bemusement and elegantly raised eyebrows. Had he not done so, neither idea could possibly have got through either Westminster or the Assemblée Nationale. So, that’s really that. The story is of interest only as a possible counterfactual analysis: what if France had become a member of the Commonwealth in 1956? On the other hand, it might be worth one’s while to speculate a little as to why Mollet came up with such a harebrained and rather desperate scheme. After all, nobody had treated Churchill’s suggestion of an Anglo-French union in 1940 particularly seriously. Mollet is generally described as an Anglophile though as someone on the left of French politics his Anglophilia remains somewhat questionable. He does seem to have been impressed and grateful for the help Britain had given the French resistance during World War II. There is the suggestion that he wanted to use the British card in his negotiations with West Germany over the Common Market. Unfortunately, the British card was no longer in the pack, having dropped out in 1955. A more serious problem in the autumn of 1956 was France’s involvement in North Africa and the Middle East. The Algerian War was beginning to take its toll in political and economic terms and the French suspected rightly that Gamal Nasser, the self-appointed ruler of Egypt was supplying the FLN with arms and ammunition in the name of the anti-colonial struggle. As a left-winger, Mollet had previously opposed French colonialism in North Africa and welcomed all chances of negotiation with the FLN. As Prime Minister, he announced that the rebels had to be defeated first and negotiated with afterwards. Possibly, as one who had opposed the war previously, he felt anxious to prove his credentials as a strong leader. When Nasser announced the nationalization of the Suez Canal in July, France was considerably more gung-ho than Britain in her desire to punish the upstart leader. It was France that pushed the initially reluctant Israelis towards a military plan. 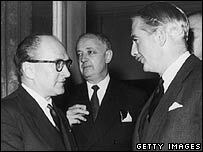 September 1956 was a time when Britain once again seemed to be dragging her feet. British soldiers had left the Suez zone. Initial support for a military solution to the crisis was waning. Israel was worried that she would find herself in the unwelcome position of the fall guy. And the war in Algeria was going on. Mollet came up with his rather desperate proposal in the hopes that Britain would be tied more firmly into the French struggle to hang on to Algeria and other parts of North Africa, nipping the growing anti-colonial fight led by Egypt, if not precisely in the bud then not too long after early flowering. The ideas were rejected and the Suez adventure ended badly, not least because of lack of American support. As it happens, the Israelis were successful beyond their wildest dreams in the Sinai but Nasser and other Arab leaders chose to ignore that, concentrating on the humiliation of the two colonial powers, France and Britain. It was after the Suez debacle that Konrad Adenauer told Mollet that he should make the European Community his revenge for Suez and the negotiations proceeded apace. Britain chose to learn another lesson which, given the much closer cultural links with the United States, made perfect sense: a revival and fostering of the “special relationship”. The Algerian War went on to its disastrous ending and Nasser’s refusal to accept that Egypt had been militarily defeated in Sinai led almost inexorably to the catastrophe (from the Arab point of view) of the Six-Day War in 1967. Would any of it have been different if Mollet’s proposals had been taken seriously? This is the one, Tory Historian suspects, everyone has been waiting for. Are there any new quotes from Margaret Thatcher? Well, I have chose a couple of less well known ones but, I expect, most of our readers on this side of the pond will have heard them. Why do you climb philosophical hills? Because they are worth climbing. There are no hills to go down unless you start from the top. Though not, perhaps, for those who think the state is the one to solve all the problems. Before I get on to the lady everyone is waiting for (and there has been a fair amount of posting about her) let me produce two quotations from that greatest of all communicators, probably the greatest twentieth century American president, Ronald Reagan. One well known, one not so well known. They just don't make 'em like that any more. Tory Historian has been reading instead of going to exhibitions (well, apart from following the abysmally bad East meets West trail at the Tate Britain) and the book of choice is John O'Sullivan's "The President, the Pope and the Prime Minister", already out in the United States and due out in the UK in the spring. This will be a must-read for all conservatives with either a big 'C' or a small one as it tells the story of three conservatives (Reagan, Thatcher and John Paul II, since you ask) who, n ot so long ago, changed the world we all inhabit. There will be more postings on the book but this time I would like to recall one of the players: John Paul II, the man who helped to reignite the fight against Communism in Eastern Europe and gave hope to many millions of people there. One does not have to be a Roman Catholic to understand and admire the man's achievement in the political world. Freedom can, indeed, be quite frightening. But slavery will not provide anyone with security. Back in the days Tory Historian studied A level history there was a saying (one with which most readers are probably familiar). Only two developments in history are inevitable: the country (whichever country) is always going to the dogs and the middle classes are always rising. In fact, there was an urban myth of a history examiner who set the following question: "Give an example of a period when the middle classes were not rising in England and explain why not." Not sure whether there were any takers. According to Andrew Roberts, a Conservative historian if ever there was one, the present rise of the middle class in the shape of Kate Middleton, possible bride to Prince William, is an entirely GOOD THING. Good for the monarchy and, therefore, good for the country. Sadly, the article is in today's Evening Standard, the newspaper with the most useless website in existence. Mr Roberts considers it rather a problem that the British royal family has consistently married either European royals (sometimes it worked but sometimes not) or offsprings of the English aristocracy (sometimes it worked but most often not). They should look beyond that rather limited gene pool to the middle classes. The last time it happened was in 1660, when Anne Hyde, daughter of the politician Edward Hyde, married James, Duke of York, the future King James II. She turned out to be an excellent wife for him, and she ran his politican and economic affairs adroitly. Samuel Pepys might have complained in his dary that "The Duke of York in all things but his amours was led by the nose by his wife," but she led him very well. Had it not been for her tragically early death in 1671, aged only 34, James might not have become one of the most disastrous and shortest-reigning monarchs. 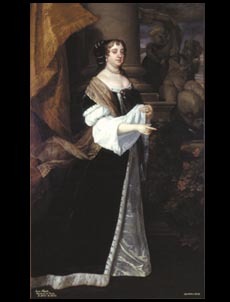 There is a wonderful idea for a counterfactual article: what if Anne Hyde, wife of the Duke of York, had not died in 1671. After all, we know that his second marriage, wherein he reverted to type, was anything but successful for him as King. Then again, would we have had the Glorious Revolution? Another Bank Holiday and another exhibition. On New Year’s Day Tory Historian visited the excellent and, alas, soon to close “At Home in Renaissance Italy” at the Victoria and Albert Museum. In parenthesis it might be noted that the V & A is a superb museum or would be if the powers that be would finish developing it and get down to running it. 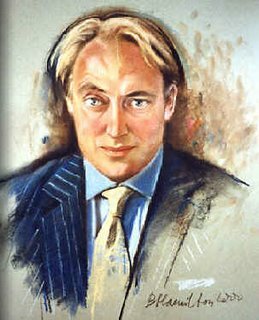 Anyway, the exhibition was not much liked by Brian Sewell, who felt that anything that was not precisely high art and …. gasp …. had a good deal of information about women (domestic life, you see) was really beneath contempt. Or wretched, as he would say. Tory Historian does not share those prejudices, not least because, as the exhibition notes made it clear, the division between art and craft was not as clear-cut in fifteenth and sixteenth century Italy as it has been since the Romantic period. Mr Sewell, of course, knows that, but makes a point of being contemptuous of many things. Indeed, the inevitable focus on women and their role was a particularly interesting aspect of the exhibition. The great households of the Italian nobility and the smaller households of the financiers and bankers together with the smaller or, at least, poorer households of the merchants and townsfolk and peasants were run by the women. To be honest, these households resembled small and medium sized businesses and running them well required various skills. Growing out of that need was the appearance of some of the first books of etiquette, household instruction and cookery. This, of course, presupposes that a sizeable proportion of the women could read those books. The V & A, on the whole, does not believe in dumbing down. The notes in the permanent and temporary exhibitions can be populist but are definitely on the educational side of the divide. Here they provided a good deal of information and were heavily spiced with useful quotations from contemporary works of literature and instruction. There were one or two mis-steps. Incorrectly, it was pointed out that women’s lives revolved entirely around their biological cycles. The rest of the exhibition gave a lie to that comment. Of course, biological cycles were and are important. Equally, birth, marriage and death were and are crucial events in all lives and many rituals surrounded them in the Renaissance and do so now. But, as I said above, running those households required skills, training and ability. 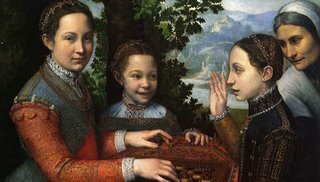 On top of which, they had to entertain guests, be knowledgeable at least to some extent about the various art and craft works around them (to be able to show them off in the right way), read books, say their prayers and teach their children and, according to the artist Sofonisba Anguissola, play chess. Clearly, the cooking both of household meals and grand banquets were heavily supervised by the mistress of the house, who took part in some of the preparations, particularly of such things as pastry or some special cordial. Tory Historian possesses a Penguin edition of a book of sixteenth century recipes, edited by Hilary Spurling, “Elinor Fettiplace’s Receipt Book”. The Fettiplace family were undoubtedly aristocratic but it is clear from the collection and the “receipts” in general that the lady of the house ran the house, particularly as her husband was frequently away at court. Part of that entailed keeping a collection of recipes for cooking, medication, cordials and preserves. The recipes may have been written out by a secretary but Lady Fettiplace had clearly added new ones and made notes on others. She also swapped recipes with others, like Sir Kenelm Digby and various relatives. It would be interesting to work out exactly when that attitude changed and it became a badge of honour to the family for the ladies of the house to be idle. There is an interesting conversation in “Pride and Prejudice” that might indicate a change at that very time, though Jane Austen herself, together with her sister, had plenty of domestic duties. Mrs Bennett has come to visit Jane and Elizabeth who are staying perforce at Netherfield, Mr Bingley’s house. On Elizabeth’s enquiry about her friend Charlotte Lucas, Mrs Bennett explains that she and other Lucases had called in but Charlotte could not stay long as she was wanted at home in connection with the mince pies. Sir William Lucas clearly ran an old-fashioned household in which the women had plenty to do and the boys, possibly, less so. Mrs Bennett explains rather proudly to Mr Bingley and the others that as far as she is concerned there were servants to deal with such matters as the mince pies. That raises an interesting question: exactly what did the Bennett girls do with themselves day in and day out? A very happy and prosperous new year to all readers of the Conservative History blog (and of the Journal, whose next issue will appear in January). Tory Historian intends to carry on writing the somewhat random postings of the kind that appeared last year and hopes that many more readers will join in the discussions. Together with my co-blogger, Iain Dale, I hope that many more of you will join in the Conservative History Group activities and, if you have any ideas about them, please let us know either here or through the Conservative History Group website. In the meantime, let me remind everyone of an interesting historical date. On January 2, 1776 the Continental Congress published the Tory Act, a set of instructions on how to deal with those misguided, misinformed and mistaken individuals who persisted in supporting loyally their King and Country, that is George III and Great Britain. The instructions were mild and smacked more than a little of a desire to re-educate those who have been “been deceived and drawn into erroneous opinions, respecting the American cause, and the probable issue of the present contest”. Sadly, as the war proceeded, many of these good intentions were abandoned and Loyalists found that they had to flee for their lives (those who managed it). Never mind – Canada benefited.